Welcome to week 5 of my vegan meal prep ideas posts! I hope you guys are getting a good idea of how food prep works now and have started incorporating a weekly prep into your routine. 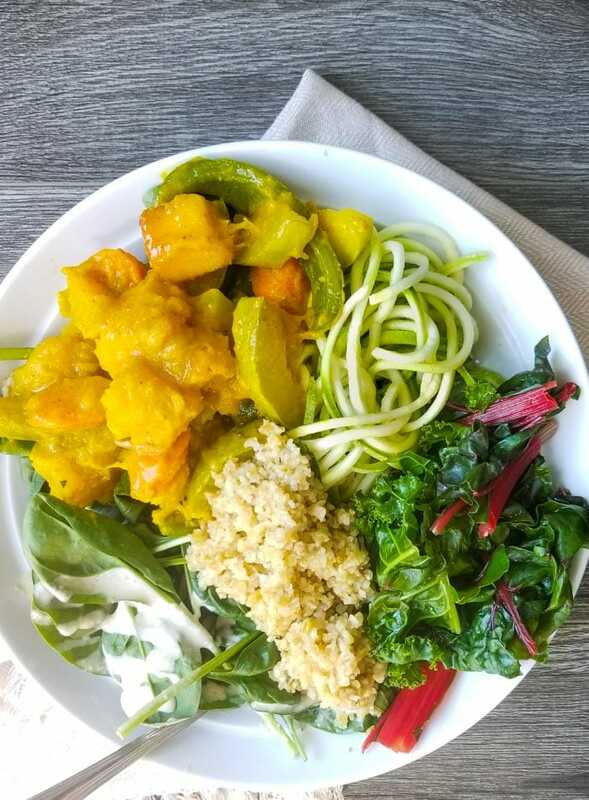 This was one delicious week with turmeric lentils, raw hemp seeds brownies, coconut banana bars and a amazinglya creamy squash curry. This weeks prep took me just over 2 hours start to finish. It was a bit more work this week with 3 types of squashes to prepare but all in all it was still a pretty quick and easy prep. To get this done in two hours, I started with chopping and dicing veggies since I needed them for the curry and lentils anyways, then I prepped the squash and sweet potato for the oven. I baked the kabocha squash, whole sweet potatoes and roasted sweet potatoes all at the same time. While those where in the oven, I made the curry and the lentils. While those were cooking on the stovetop, I prepped the brussels and kale for steaming then took care of those after the curry and lentils were done. While that was all cooking away, I whipped up the the two no-bake bars then finished with the 2 dressings which took all of about 5 minutes to make. Oh, and spiralized a bunch of zucchini but that only takes a minute. You can get a lot done in 2 hours if you prioritize and just get to work. I had a busy Sunday morning before I started. I ran 16 k, went to the pool and sauna, walked the dogs and ran a bunch of errands and to be honest, I really didn’t feel like doing this. I knew it had to be done though and once I started it was fine. The trick is to just start, once you get going meal prep is actually pretty easy and it always goes faster than you think it. If meal prep feels daunting to you, just start with a couple items and see what happens. Even though I often drag myself into the kitchen, once I start, I kinda get in the zone and having that food ready for the week is always worth the effort. You just gotta take action. Now I’m ready to eat healthy all week and even better, the kitchen will stay clean since we won’t be in there preparing food every day. That’s got to be one of the biggest benefits of food prep. What Else Was on My Grocery List? I didn’t have anything too specific or out of the ordinary on my list this week, in fact, I shopped for groceries without a list for the first time in I can’t remember. The way I eat is always evolving and changing and night now I’m rarely make specific recipes for prep. This makes shopping easy because I know all I really need is plenty of fresh produce. With bringing home so much fresh produce, food prep is essential to prevent food waste. If I don’t prep my veggies, there’s a good chance they won’t get eaten and I absolutely hate wasting food. For produce, I try to shop sales and buy what’s in season when I can. I found a lot of squash this week so I stocked up on those, there were grey zucchinis on sale so I a bunch of those came home. Other produce staples for my house are peppers, broccoli, zucchini, cauliflower, carrots, kale, sweet potato, spinach, frozen fruit for smoothies and prepared greens mixes for salads. I still have some rutabaga and cauliflower I didn’t prep, so I’ll do something with those later in the week. I’m thinking my root vegetable stew might be in order! And maybe my kale and cauliflower soup. My pantry items tend to last more than a week so I don’t shop for them very often. On a weekly basis, I usually need to stock up on cashews, almonds, walnuts and dates. Opo squash is quite tasty but I rarely buy it since depending on ripeness sometimes it doens’t yield much. You can eat it raw in salads but it’s usually used sautéing, stir-frying, or as a part of soups and stews. I paired it up wtih an acorn squash to make a really yummy coconut curry. 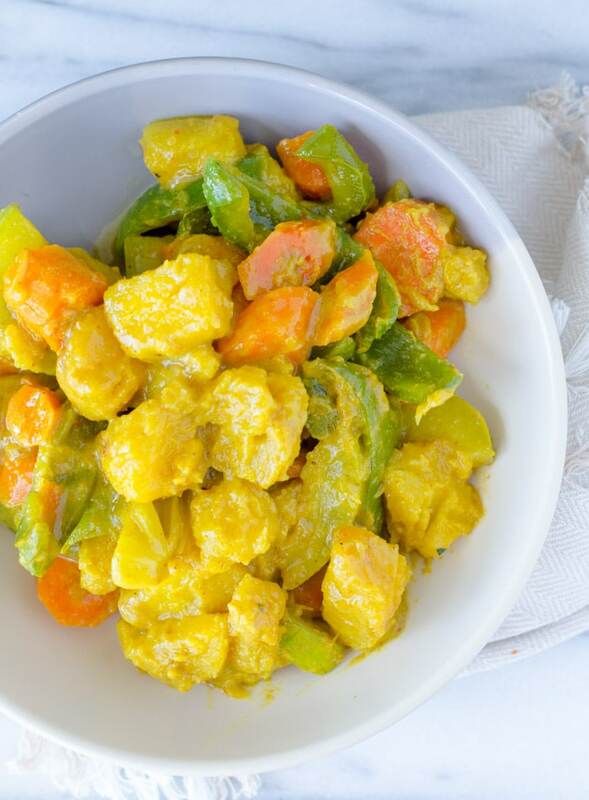 I love using squashes like acorn, butternut and kabocha to make curries because as they cook, they soften up so beautifully, almost melting into the sauce to create an amazingly creamy texture without having to add extra fat or other ingredients to a recipe. I cooked this covered over medium heat until all the veggies were tender and it was nice and creamy. It came out really yummy! I’ve got to have sweet potatoes in my weekly food prep. I vary how I make them week to week but I usually always do a couple whole baked sweet potatoes. 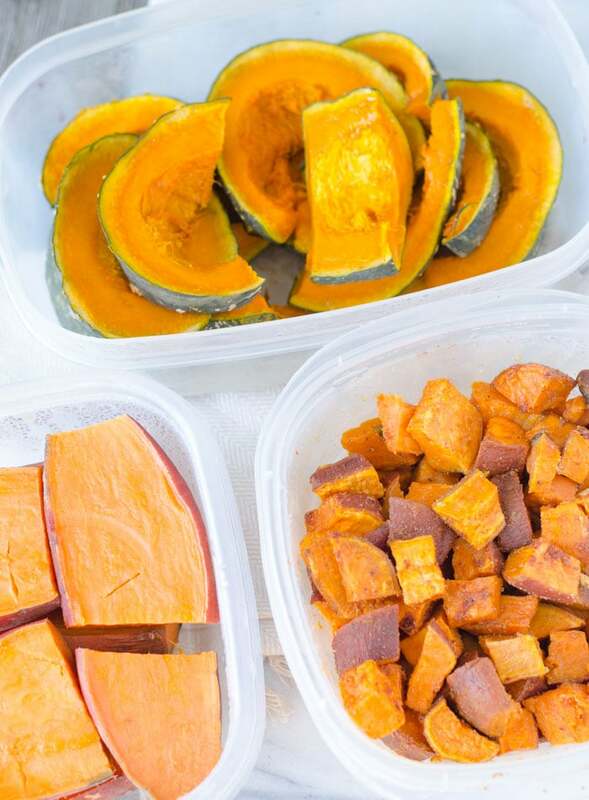 This week I made 2 whole baked sweet potatoes and a batch of paprika roasted sweet potatoes. I’ll eat these on their own, as snacks and in various salads and buddha bowls. This was a take on my favourite chickpea scramble. It doesn’t really come out the same as scrambled chickpeas but they’re easy, healthy and taste great. I’ll eat these in breakfast bowls, for a snack and on salads. To make them just add cooked lentils to a pan with mushrooms, onions and garlic, season with spices ( I used garlic powder, turmeric and sea salt) and cook with a little water to prevent it from drying out. I like to smash about half of the lentils and leave the rest whole so it has some texture to it. These came out so yummy plus you only need four ingredients and a couple minutes to make them. I’ll eat these as snacks, for dessert and chopped up for smoothie bowl toppings. To make them, add all the ingredients to a food processor and mix until it forms a dough. Press the dough into a parchment paper-lined baking pan and let them sit in the freezer for an hour or so. Cut into 16 squares and store in the fridge or freezer. You can find the full recipe for them here. 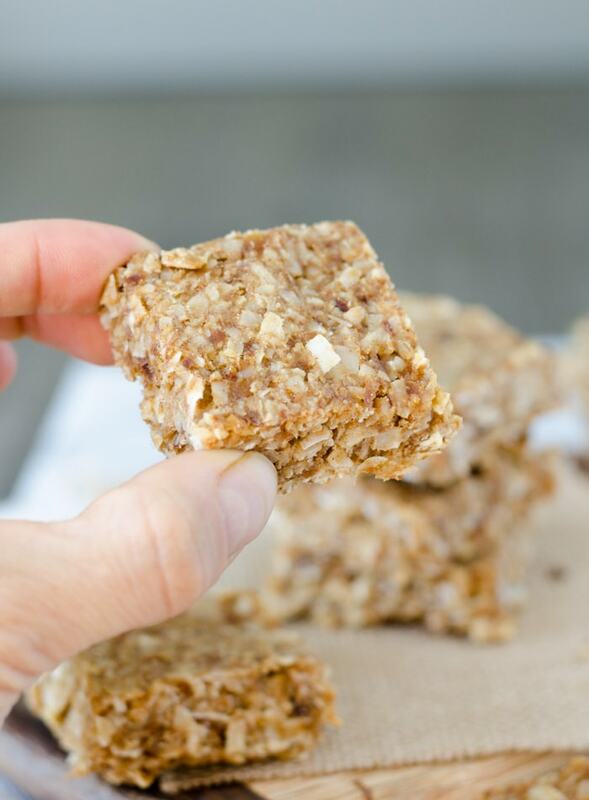 These bars came out delicious too and again you only need a few ingredients to make them. I was thinking banana cream pie when I made them. To make them, add all the ingredients to a food processor and mix until it forms a dough. Press the dough into a parchment paper-lined baking pan and let them sit in the freezer for an hour or so. Cut into 16 squares and store in the fridge or freezer. Weekly food prep is never complete without tahini dressing! 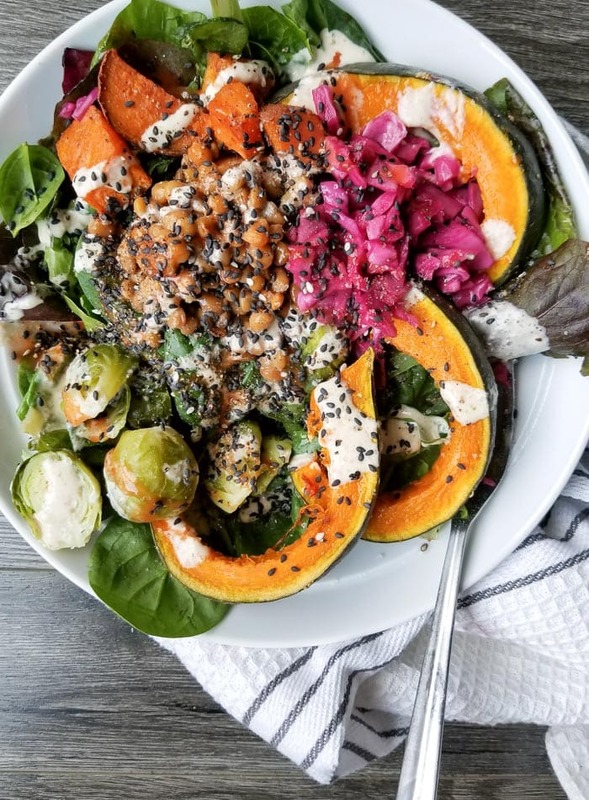 I’ll use this on just about everything: drizzled over breakfast bowls, on the baked kabocha squash, on salads, on the steamed kale and chard, on buddha bowls and with the roasted sweet potato. It goes with everything and you can never, ever go wong with tahini dressing. Homemade salad dressings and sauces are so easy to make and you don’t really need recipes to make them. Once you get the hang of making dressings you’ll be able to create endless varieties that will take your meals to the next level. To make homemade dressings, it helps to have a few staples on hand. My go-to dressing ingredients are lemon, vinegars, garlic, fresh and dried herbs, tahini and nut butters, nuts and seeds, miso, ginger, dates, maple syrup, sea salt and then whatever veggie or fruit I might feel like throwing in. Quick tip for salad dressings: use a shaker cup and an immersion blender for the quickest way to blend them up with minimal clean-up! If I’m making more than a single-serve dressings, I store extra in the fridge in mason jars. Pre-washed and trimmed green beans are one of the grocery items I usually opt for convenience with. This week, I made a batch of quick pickled green beans, which are so tasty and so easy to make! 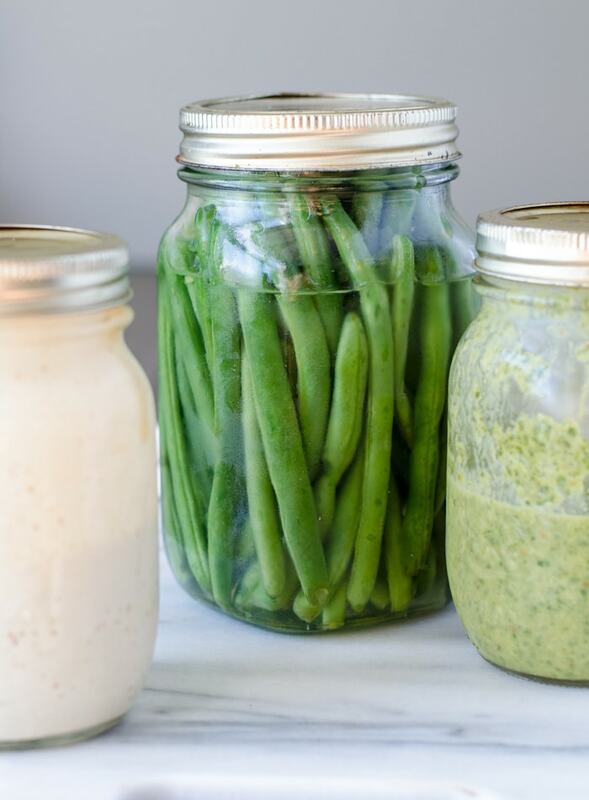 To make them, place fresh green beans in a clean mason jar and fill with water until they’re just covered. Pour that water into a small saucepan and bring to a boil with a little sugar, salt and vinegar. Boil until everything is dissolved then pour it back over the green beans, seal and store in the fridge for at least 24 hours or up to a week. I also added a couple cloves of garlic, a bay leaf and some cumin seeds to the jars. I like having some tangy veggies in the fridge for adding to salads and for snacking. Last week I made quick pickled red cabbage and I still have a bit of that left, so I went with green beans this week. Steamed Brussel Sprouts: nothing special, plain steamed brussel srpourts for sides and adding to buddha bowls. Diced and Chopped Veggies: diced onions and peppers for recipes, chopped carrots for snacking and recipes, chopped broccoli for using as needed. Zucchini Noodles: prepped a big batch of zucchini noodles for making noodles dishes and adding to buddha bowls. 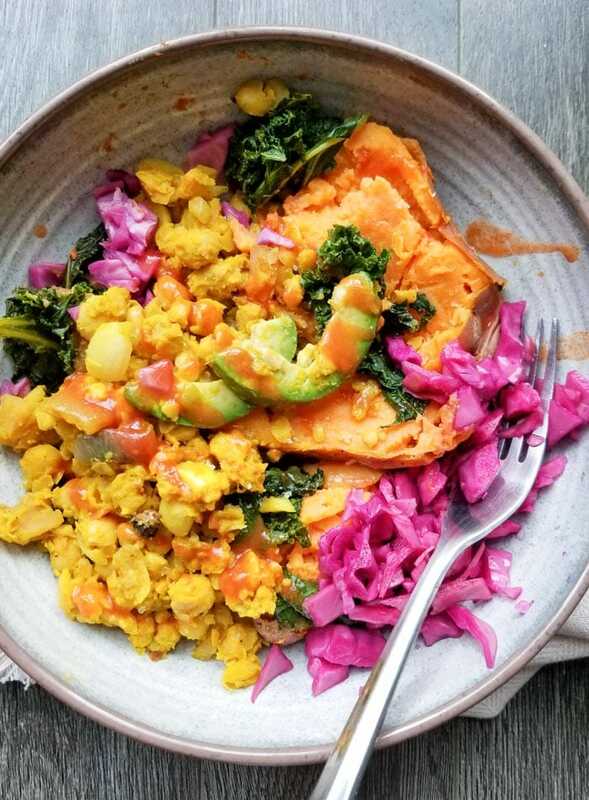 Baked Kabocha Squash: kabocha squash is my favourite squash, it has the most beautiful, sweet flavour, I baked one sliced kabocha squash, plain on a silicone baking mat, for sides and adding to buddha bowls. Grated Beets: I love grated raw beets on salads and in smoothies so I prepped a couple for use this week. Steamed Kale and Swiss Chard: gotta get those leafy greens in! Lately I’ve been enjoying lightly cooked kale and chard for adding to just about everything, I like to saute it plain in water in case I want to add some to smoothies, otherwise I’ll season as needed with salt, pepper, lemon and spices. Freekeh: cooked some plain freekeh for a whole grain this week, I prefer it to quinoa and it has 7 grams of protein per serving plus is super high in manganese and magnesium, I like Bob’s Red Milll. I use it for breakfast porridge and for adding to lunch and dinner creations. I don’t know about you guys but I totally go in phases with my meals and snacks. If I come up with something I love, I stick to it for a while before switching things up. Here are some of my favourite meals, snacks and drinks lately, as well as some supplements I’ve been taking. 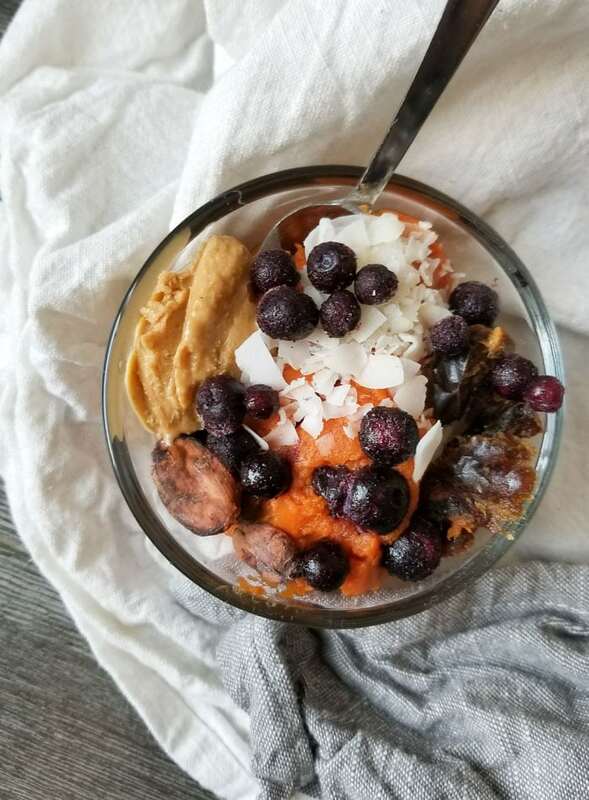 I’ve been loving little bowls of pumpkin goodness for snacking and desserts these last couple weeks. I love Farmer’s Market Pumpkin Puree, especially this time of year and I almost always have it on hand. To make these just add some pumpkin puree to a small bowl, add your favourite toppings and dig in. I eat it unsweetened but if you prefer you can mix it with vanilla protein, stevia, a drizzle of maple syrup or blend it with a few dates. dates, raisins, figs, mulberries etc. I’ve used various adaptogens inconsistently over the years but over the last few months I’ve gotten more consistent with them. 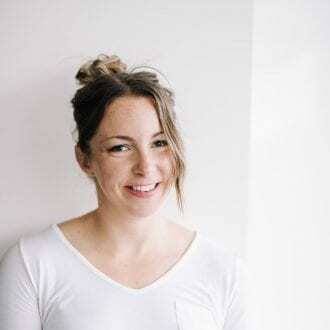 Adaptogens (in terms of herbal medicine) are natural substances considered to help the body adapt to stress and to exert a normalizing effect upon bodily processes. A well-known example is ginseng. You can read more about them in my post on specific adaptogens and their benefits. My go-to way to use them in either blended into my Four Sigmatic Mushroom Coffee or Elixirs, or blended into a smoothie. I’d do something like Four Sigmatic Cordyceps Elixir with MCT oil, cacao powder and ashwaganda, or the Cordyceps Mushroom Coffee with coconut milk, maca and cashew butter. There are endless variations of elixirs you can create with them and they always taste amazing! There are a ton of others you can use but those are the ones I’ve been using consistently and I’ve noticed I have had more focus and extra energy lately. The ingredients in the Four Sigmatic Elixirs and Coffees, such as cordyceps and rhodiola are actually adaptogens too. I’m totally in love with all their products and have been using them every day. 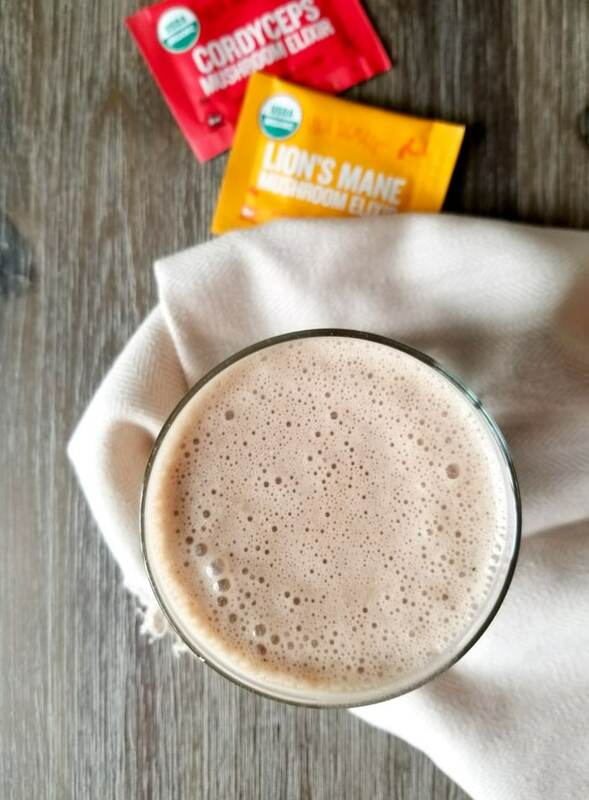 I love the Mushroom Coffee in the morning, the Cordyceps or Lion’s Mane Elixir in the afternoon and the Reishi Elixir before bed as part of my evening routine. If you want to purchase some, use the code RUNNINGONREALFOOD at check-out for 10% off your order. Click here to purchase. I keep hearing over and over and over again the importance of these two supplements if you don’t eat animal products. I’ve finally gotten consistent with taking both for the last month or so and I’m feeling really good about it. This has been my weekend dessert for weeks on end. Take a banana and cut it lengthwise and lay it flat in a bowl. Thaw some frozen strawberries stovetop and add those, then add some chopped almonds, flaked coconut and a drizzle of quick, homemade vegan chocolate sauce. If you want to go all out, add coconut yogurt or coconut whipped cream. If you really want to go for it, caramelize the banana in coconut oil and cinnamon. OMG. There are a bunch of different ways you can make chocolate sauce. You can mix chocolate protein powder and cacao with almond milk, you can blend dates with cacao powder and hot water, you can mix maple syrup with coconut oil and cacao. I love caramel sauce for this too, you can grab some ideas for easy, healthy caramel sauce in this post. You can grab the recipe for this here. I’m hooked, it’s delicious, you gotta try it. You can make all of it as part of food prep too, then enjoy it for breakfast all week long. The one below also has the pickled cabbage I made last week. I’ve been incorporating more plain organic hemp protein into my diet lately and this has been a yummy snack the past couple weeks. Just blend chia seeds with a couple tablespoons of hemp protein, some cacao powder, a few dates and a bit of water and let it set in the fridge until firm. It’s high in omega-3, protein, tons of minerals and antioxidants and it tastes great. You can also add things like coconut, nut butter, avocado or hemp seeds. 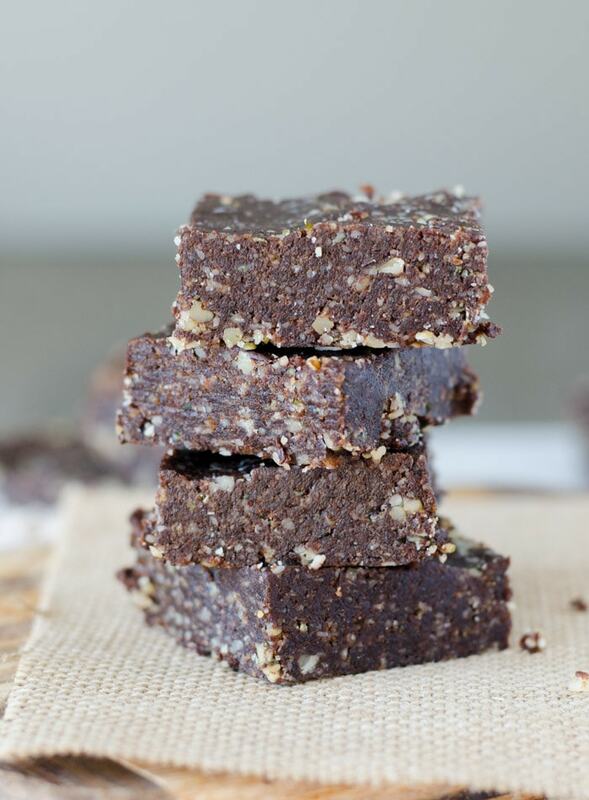 Top it with almond butter and cacao nibs for a treat! Take a date, stuff it with coconut butter and a dry roasted salted almond. Eat. Try not to eat like 20 more. I hope you guys found this weeks food prep post helpful. To check out all my previous food prep posts, click on the link below. These all look so delicious can’t wait to make some! I would LOVE LOVE LOVE to make the dish in the picture at the top of the page but I don’t see the recipe. Where can I find it?